Here’s a perfect solution for those of us who want that gorgeous festive bird to unveil for a small group of people. 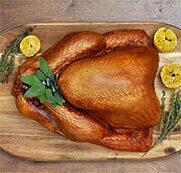 Buy 1 whole Canadian turkey at your local grocer and get the butcher to cut it into 2 halves. If your turkey is fresh, you can freeze the other half for another meal. The butcher can also cut a frozen turkey in half, so you can defrost and eat one immediately and place the other half directly into the freezer. Either way, this is a very economical way to have a beautiful turkey dinner for a small dinner group. If your bird is frozen, place in the refrigerator to defrost. Visit our thawing section for safe ways to thaw a frozen turkey. Rub both sides of the turkey with olive oil. Combine all spices to make a rub. Sprinkle generously onto both sides of the bird. Slice your onions roughly into 1-inch rounds. Peel and wash the carrots. Pour wine and chicken broth into your roasting pan. Line the bottom with onions, whole carrots, unpeeled garlic cloves and rosemary sprigs. Place the bird on top of all the vegetables, cut side down. 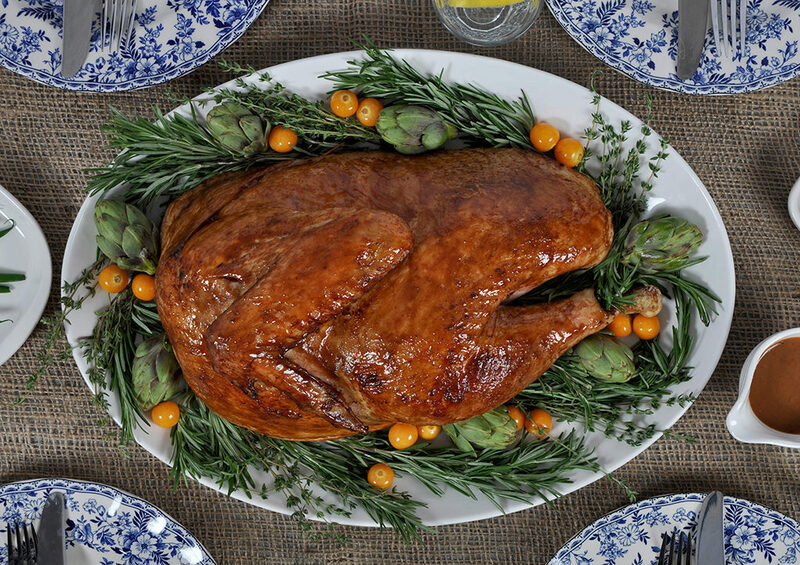 Cook the turkey for 1 ½ - 2 hours until cooked through. Test for doneness with a meat thermometer. Turkey should reach an internal temperature of 170°F (77°C) in the breast and 180°F (82°C) in the thigh. Remove the turkey from the oven and let rest for 15 minutes before carving. Here’s an easy and quick way to make some homemade gravy to serve with your bird. Take your pan drippings and skim away all but a few tablespoons of fat away. Add the garlic and half the cooked onion to the sauce pan. Combine 1 tbsp corn starch with a ½ cup of milk until dissolved. Add to the saucepan. Stir over medium heat and bring to a simmer. Lower the heat until the mixture thickens and serve in a gravy boat.